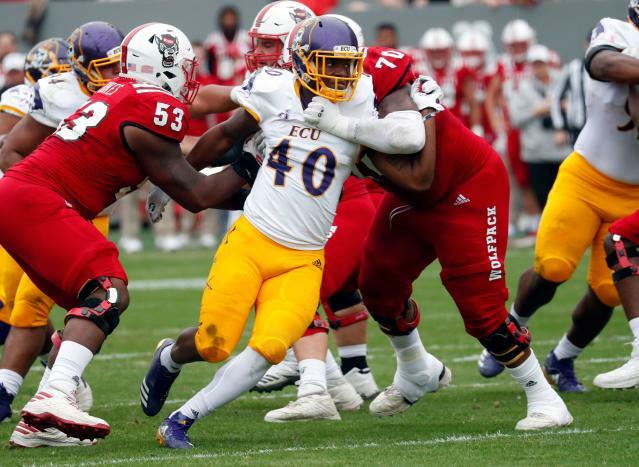 East Carolina defensive end Nate Harvey won’t be playing college football in 2019. Harvey, who had 14.5 sacks and over 25 tackles for loss in 2018 and was named the American Athletic Conference Defensive Player of the Year, had appealed the NCAA for an extra season of eligibility. New East Carolina coach Mike Houston said after spring practice Saturday that Harvey’s appeal had been denied. Harvey transferred to East Carolina from Georgia Military Academy. He played sparingly there as a freshman and was asking the NCAA to grant an extra year of eligibility because of that season. New NCAA rules in place in 2018 let players play in up to four games in a season and still retain redshirt status. Harvey’s 14.5 sacks placed him fourth in the country behind Louisiana Tech’s Jaylon Ferguson, Kentucky’s Josh Allen and Northern Illinois’ Sutton Smith. His defensive season was one of the most impressive in the country independent of the fact that he played running back in 2017 and appeared in just five games. East Carolina finished the 2018 season at 3-9. Houston was hired at the end of the season to replace Scottie Montgomery.